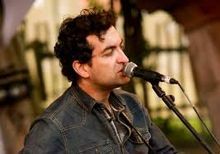 Galway singer/songwriter Ultan Conlon has become recognized as a master songwriter in his native Ireland. His talent for capturing the human spirit through his lyrics has been honed over almost two decades of writing and performing original material. As his confidence to craft great songs grows, so too do the captive audiences he draws in at his live shows. The quality of his songwriting is matched only by his voice, both powerful yet fragile, that some critics have likened to the great Roy Orbison. Ultan’s back catalogue – two EPs and two studio albums to date - has received extensive international radio airplay, inclusion on the award-winning movie, Songs For Amy, as well as receiving numerous positive reviews from critics-turned-fans. He has also performed on Irish national television several times. It is perhaps his most recent offering, Songs Of Love So Cruel, however, that deserves most attention. Co-produced and mixed by acclaimed engineer Colin Elliot (Richard Hawley), Ultan and a full band returned to Ireland from performing the new album to a full house at the infamous Viper Room on Sunset Boulevard in Hollywood. More recently an invite came to return stateside as guest to, The Watkins Family Hour, at Largo, Los Angeles. Ultan performed songs with Jackson Browne and Shelby Lynn. Songs Of Love So Cruel has been featured on national radio broadcasters including RTE, Today FM and Newstalk as well as enjoying extensive airplay in the UK on BBC Radio 2. The latest single'In The Mad’ reached 68 in the airplay charts, the second highest placed independently released Irish single of that week. It remained on the RTE playlist for an incredible five weeks. Five songs from Ultan’s latest offering were also featured alongside a score he co-composed with guitarist Eoin McCann in the award winning film Songs For Amy, which played at IMC cinemas nationwide (IRL) in May 2015. UK and American theatrical releases are now scheduled to happen very soon. Songs For Amy screened at the Boston Film Festival as well as The Newport Film Festival (2012), where it took home the Just Award. Having shared the stage with the likes of Jackson Browne, Shelby Lynn, John Grant, Eddi Reader, Patty Griffin and Richard Hawley, Ultan has also performed duets with Glen Hansard and John Martyn. The latter Scottish folk legend later went onto record one of Ultan’s early works, Really Gone, in 2005.